A common problem busy entrepreneurs and professionals have is that business calls often interrupt their personal time, whether it be after hours or on the weekends. Here’s an easy way to reclaim your work/life balance. Many small business professionals have their office phones forward their calls to their mobile devices while they are away from their desks. Or maybe their cell is their office phone! But that means the phone keeps ringing outside of that 9-5, M-F window. Some people might suggest that these professionals simply deactivate their call forwarding and have calls go to voicemail while they are off duty. But that’s not always an option for everyone. What if there is an emergency? Or how about opportunities to do some business? What about wanting to provide great customer service? Those are things that can’t be missed and voicemail is not an effective solution. That fear or missing out is what drives many business folk to take calls on their cell phones on during evenings and weekends. However, this doesn’t mean these professionals want to deal with trivial matters that inevitably come up when answering every call. These kinds of matters that get forwarded to their personal lines during their downtime are a major interruption to what should be an opportunity to relax and spend time with friends or family. It’s a tricky situation, and entrepreneurs often feel tethered to their phones. But there is a solution! Here’s where a after-hours answering service takes the reigns so you can reclaim your weekends and leave work at work without ever missing a business opportunity. A professional answering service like ours is available around the clock. So, when you leave the office, all you have to do is flip the switch and any calls that come in after hours or over the weekend will be handled by a friendly, experienced representative of your business. Helpful receptionists take care of your callers while you enjoy your time off! So anytime someone calls your business outside of regular hours when you’re around who is looking for some basic information, would like to open a customer support ticket, wants to place an order, or needs help scheduling an appointment is in good hands while you enjoy life. All call details are available for you to view at your leisure and follow up on if necessary whenever you’re back in the zone. Messages can be relayed to you by email, pager or text message, and all information is logged to a secure online portal that you can access from your computer or smartphone. Non-pressing matters can even be completely resolved by call agents to minimize the amount of messages and calls you must return when you get back to the office Monday morning. What about calls that really need your attention? 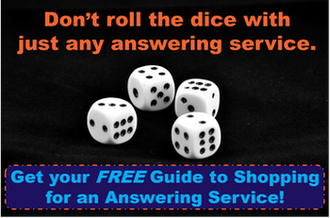 You can work with your answering service to define what constitutes a call that must be forwarded to you. There are certain types of calls that you are uniquely qualified to handle, so the remote receptionist can transfer the calls that fit your criteria. This ensures that your cell phone will ring on the weekends for business reasons only in truly urgent situations. Your personal time should be just that: getting to spend time with your family, going out with friends or relishing alone time without being disrupted by business matters. Reclaim your weekend! This entry was posted in Answering Service, Business and tagged answering service features, business tips, no missed opportunities, small business by Jessica Truong. Bookmark the permalink.